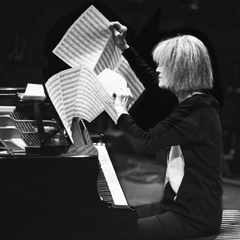 Andando el Tiempo features new music of wide emotional compass by NEA Jazz Master Carla Bley, and underlines her originality and resourcefulness as a jazz composer. "Saints Alive!" sets up animated conversations between the three musical participants with striking statements from Steve Swallow's bass guitar and Andy Sheppard's soprano sax. The stately "Naked Bridges/Diving Brides" draws inspiration from Mendelssohn and the poetry of Paul Haines. And the powerful three part title composition - which addresses the trials and tribulations of recovery from addiction - moves through sorrow to hopefulness and joy. The trio with Sheppard and Swallow has been an ideal vehicle for Carla's writing for more than 20 years and also provides one of the best contexts for her unique piano playing. Like the critically lauded ECM album Trios (2012), Andando el Tiempo was recorded at Lugano's RSI Studio and produced by Manfred Eicher.